Introducing the varied events in the forthcoming International Data Week, Geoffrey Boulton, CODATA President, presented a Venn diagram illustrating the overlapping interests and activities of the three organisations jointly behind the week: CODATA, the World Data System (WDS) and the Research Data Alliance (RDA). WDS was characterised as the organisation directly involved in stewardship: hosting, curating and distributing databases and services. CODATA was characterised as representing the international and interdisciplinary aspects of scientific data policies and practice. We are very familiar with CODATA and perceive during the course of this week a tighter focus on undertaking activities fitting into a better defined strategic framework than previously. CODATA is keen to work closely with ICSU and to preserve a constructive working relationship with RDA. 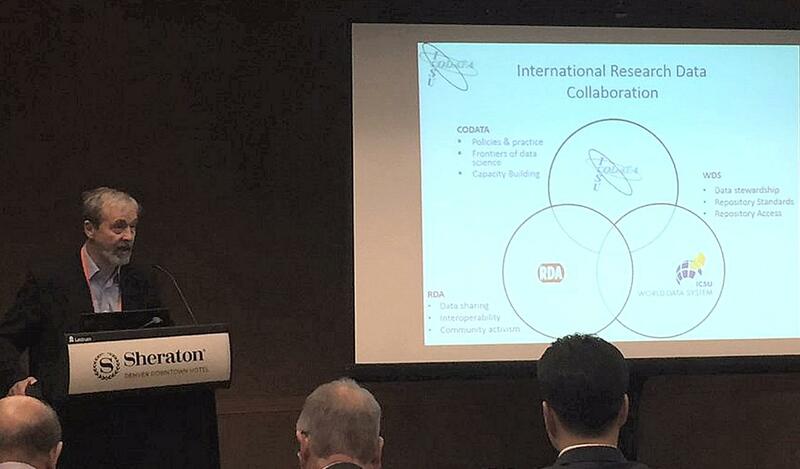 The former was apparent during this week by the involvement of ICSU Executive Director Heide Hackmann in CODATA events relating to endorsement and promotion of the Science International "Open Data" Accord (see below), and to efforts by CODATA to persuade Union members to work together on joint projects. The IUCr response to the Accord was highlighted as exemplary by the CODATA Executive Director during the CODATA General Assembly. RDA was characterised as providing tools and practical solutions in the broad areas of data sharing and interoperability. It was also suggested that CODATA was driven by National Members and by Unions representing the needs of their disciplines, while RDA was mainly driven by individuals. However, RDA does have an Organisation category of membership, and an Organisational Assembly which may have some influence in setting the agenda to fit the needs of a variety of Organisations (including commercial publishers). There is certainly some complementarity between the approaches of the two bodies: RDA works mostly through Working Groups, which have 18-month lifetimes and are required to produce a Recommendation closing off their issue of concern. There are also Interest Groups of indefinite duration, which act as discussion forums for common interests. These can be discipline-specific (at this Plenary there were sessions of the Chemistry and the Photon and Neutron Sources Interest Groups). IGs can spark new projects tackled by specific Working Groups, or they can produce more substantive results, such as the recommendations of the Legal Interoperability Interest Group. Geoffrey Boulton then led a wide-ranging seminar discussion on the future role of CODATA. Among contributions were a discussion on the need to define more explicitly the various uses and connotations of the word "data" and associated phrases such as "big data", "open data" etc. It was mentioned that approaches to data stewardship and curation had broad cultural variations – in the natural sciences, curation needed to handle revision or correction of scientific models (cf the paradigm of continuous improvement of macromolecular crystal structures being promoted within the macromolecular structure community for PDB depositions), while in the human sciences, curation was more often focused on the idea that collected data should not change. This could be of some importance if the anticipated merger between ICSU and the International Social Science Council were to take place. The question was posed of whether we needed a new metric of reproducibility, and there was general concern that the more "open" data becomes, the greater the potential risks associated with understanding the quality and reliability of found data. There was also discussion of the synergies and distinctions between "open data" (useful primarily for scientists) and "open science" (intended to be for all), and the ever-present need to interpret the implications of scientific data accurately for governments and for the general public. Concern was also raised about the practical difficulties of implementing unfunded mandates, and attention was drawn to libraries as bodies that had a long-standing ethos of protecting the scholarly record, although they did not always have the detailed technical expertise now required. 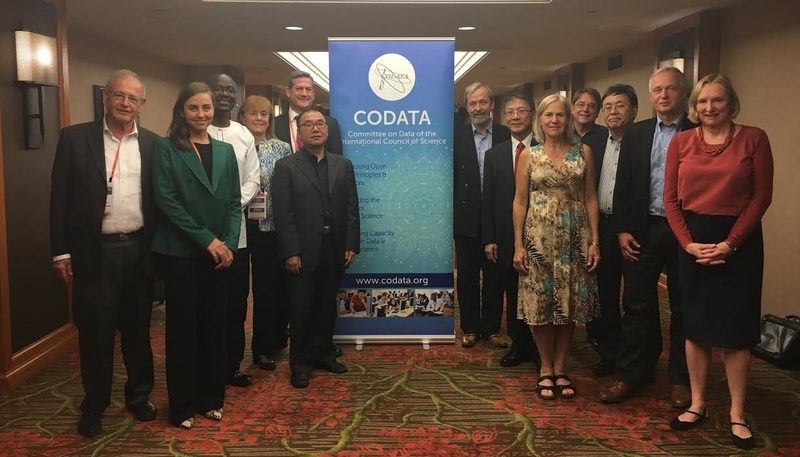 This links to the ongoing need for capacity building, and CODATA’s energetic efforts to promote data science training and growth. (i) Global Science and the need for capacity building. This was seen not just as a way to increase the membership base, but as an opportunity to rethink the geopolitical balance of science. (ii) Integrated Science and the ever-increasing need for interoperability. This was especially needed between the natural and the social sciences, and was seen in the context of a possible merger between ICSU and the International Social Science Council (ISSC). Plans for such a merger anticipated an "International Science Council" which would want to address a new global scientific initiative. At present, the only proposal for such a venture involved the concept of "Open Data". (iii) Open Science and trans-disciplinarity, with greater involvement of the public and the need to inspire funders and donors and to train scientists in pursuing Open Science. (iv) Promotion of greater interdisciplinary collaboration, feeding into the science policy role. Because scientific data was seen as crucial to most of these areas, ICSU valued the experience of CODATA and the WDS, but did not wish to leave it solely to these bodies. Hence ICSU wanted to work more closely with CODATA and to create more synergies between the various components of the ICSU family. The Science International Accord Open Data in a Big Data World set a very good example of how this might be achieved. In response to a comment by John Helliwell that "World Peace" was a striking omission from the UN Millennium Goals, but an aspiration that could gain much from the input of the scientific community, Heide Hackmann acknowledged that peace and stability were very much on the radar of the ISSC, and that the next World Science Forum would be on the theme of "Science for Peace" in Jordan in 2017. She went on to suggest a UN International Year for Scientific Data, an idea that was well received and subsequently repeated at the International Data Forum session. The General Assembly also considered aspects of CODATA business. Progress in the last two years had been rapid and extensive, and was well summarised in the document CODATA Prospectus: Strategy and Achievement, 2015-2016 available from the CODATA website. Among the most successful of recent activities had been the contribution by CODATA President Geoffrey Boulton and Executive Director Simon Hodson to a major international accord, Open Data in a Big Data World, sponsored by Science International, a forum involving ICSU (International Council for Science), IAP (the Inter-Academy Partnership), ISSC (the International Social Science Council) and TWAS (The World Academy of Science). In response to a request to endorse this Accord, the IUCr had produced a booklet describing the position taken by the crystallography community on this issue. Preparation of this considered response was applauded, and the booklet held up before the General Assembly as a model of how to engage in such an exercise. The organisation continued to run at a small deficit, as sanctioned by the previous General Assembly as part of a strategy to encourage additional members to join. The Executive Director was involved in an ongoing project to survey and develop sustainable business models that was now sponsored by the OECD. Early indications were that the International Data Week was successful in attracting a lot of interest and participation (there were over 620 registrants for SciDataCon and over 800 for the Week as a whole). The CODATA Prize for 2016 was awarded to David R. Lide, Director of the NIST Standard Reference Data Program 1969-1988, and Founding Editor of Journal of Physical and Chemical Reference Data. The Task Group for Fundamental Constants continues under its status as a standing activity of CODATA.